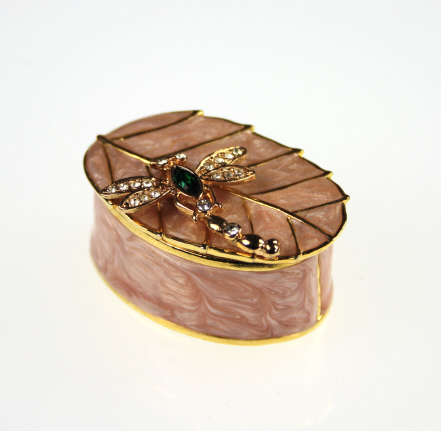 This metal box with dragonfly attached is covered in a layer of beautiful luscious pink enamel. The dragonfly is encrusted with diamanté and bright emerald green body and has a lapel pin fitting, therefore it can be detached and worn as a piece of jewellery making this an ideal unusual gift. Miniature Toadstool Trinket Pot. A miniature bright red toadstool with a jewel encrusted fairy perched on the top. Miniature Caterpillar Green Cabbage Trinket Box. Just the gift for gardeners!